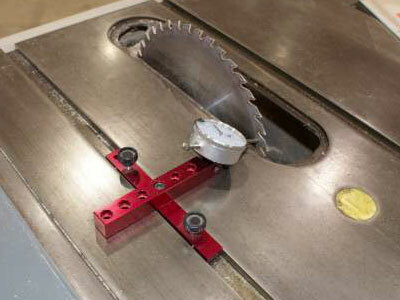 Download the Table Saw Test 3: Checking Table Saw Alignment Manual. As mentioned in “Understanding Our Objectives,” when we perform an alignment on the table saw, we want to set the arbor shaft perfectly square to the miter slots. The easiest way to accomplish this is to use the saw blade as our “reference plate”, with a dot near the outside of the blade acting as the same point for measurement at the front and rear of blade rotation. I like to do my alignment using the left slot, as that is the one I normally use for most of my miter and cross-cut work. Therefore, I would place the mark on the left side of the blade. NOTE: The procedure below is for cabinet saws with 4 bolts (one at each corner of the cabinet) holding the top in position, and contractor saws. If you have a cabinet saw with 3 bolts (1 centered rear bolt and 2 front bolts) like the Powermatic 66, you should set the zero at the rear of blade rotation, and slide the indicator and rotate the blade toward the front to determine the alignment of the saw. On these saws, the rear bolt will act as a pivot when adjusting the top of the saw. Using this technique will help make alignment of the saw much faster and easier. Step 1. 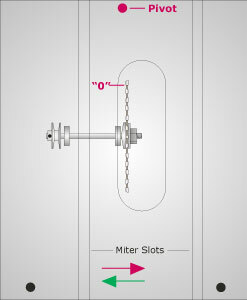 Configure the A-Line-It as shown in the photo to the left, in the miter slot of your choice. Note that the tip of the indicator is pointing downward. This is done to increase the distance point-to-point as we rotate the blade front-to-rear. This makes the error in our alignment more obvious. When you tighten the indicator on the mounting bar, make sure the plunger will not rub on the edge of the opening in the table saw top. This can cause the plunger to “drag,” making alignment more difficult. Step 2. Rotate the saw blade to position the tip on the indicator to mark on the blade. 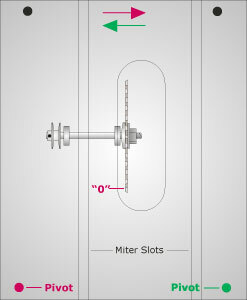 Loosen the locking knob on the dial indicator, and rotate the dial so the pointer on the indicator is aligned with the “0” mark on the scale. Step 3. Slide the indicator toward the rear of the saw as you rotate the blade toward the rear of the saw, as shown in the photo to the left. Align the tip of the indicator on the dot on the blade, and note the reading shown. I would repeat this procedure 2-3 times to insure that the readings are consistent. The difference in the measurement at the rear from the “0” at the front. Each mark on the dial is one-thousandth (.001”) of an inch. Whether the blade is closer (or farther) at the rear to the miter slot than it is at the front. If the reading went above “0” it is closer, and below “0” it is further from the slot. The type of saw you own will dictate how you make adjustments to the machine. 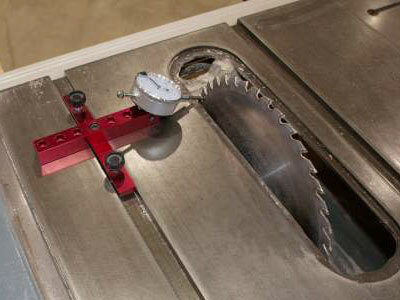 On cabinet saws, the top of the saw is moved to adjust the alignment, as the “mechanics” of the saw are mounted to the cabinet. On contractor saws and most hybrid saws, the “mechanics” normally are mounted to the bottom of the table saw top, and the alignment is accomplished by loosening the rear trunnion bolts and moving the rear trunnion to get the saw aligned. Regardless of which type of saw you own, aligning it can be fairly easy, providing you understand what’s going on as you try to make adjustments. A good saw alignment can make a tremendous difference in the way the saw performs, and is worth spending the time to do. Hopefully, you will find the following information helpful as you align your saw. Note: Since the blade is between the mounting points of the mechanics of the saw, the “0” reference point will also move slightly as you make adjustments. For this reason, be sure to “re-check” the “0” after making adjustments, and re-set the “0” if needed. It may take a few attempts to get the saw aligned properly, but is worth the effort. I expect a lot from my table saws, and like to have them as close to perfect as possible. Though it can be difficult to get “specs” from manufacturers, I know that one manufacturer of a very high quality saw says that .010” (ten thousandths of an inch or 1/100 of an inch) is acceptable. I wouldn’t argue with those specifications, but personally like to see my saws have the blade between “0” and .003” (three thousandths) parallel to the miter grooves. If the reading at the front of the blade is under “0,” move the front of the saw to the right.If the reading at the front of the blade is over “0,” move the front of the saw to the left. The contractor saw can be one of the most frustrating machines to align, if you try to do it according to the factory manual. Trying to “fine tune” a machine using a piece of wood and a hammer is difficult, and you may end up with a saw that is in worse condition when you are done than it was before you tried to align it. Though I don’t intend to use this manual as a “sales tool,” I suggest you read the section on “Contractor Saw PALS” before you attempt to align a contractor saw.